Anyone who's ever scoffed a large pizza with stuffed crust, extra pepperoni and a blanket of cheese on top and then wished they hadn't for the calorie-count, (isn't that everyone?) this is for you. Apparently, researchers at St. Bonaventure University in the US have discovered that if we draw some of our favourite comfort foods, like cupcakes or pizza (instead of giving in and eating them) we could improve our mood. I'm a bit cynical about this. To start with, what if the fun of drawing was the thing that lifted the spirits, rather than the item of food that they were focusing on? Many artists claim they love to paint and draw because it takes them away from their busy lives and acts as a kind of meditation. Drawing is relaxing, and just a 5-minute doodle can coax your mind away from life's problems and help you to switch off. And I'm not convinced by the statistics either. Those drawing pizza managed to lift their mood by 28%, and those drawing cupcakes increased their moods by 27%. Strawberry-artists had their moods lifted by 22%. And those who drew a pepper only felt 1% better after their picture was finished. This is easy to explain. You can be creative with cupcakes or pizza - toppings, colours, shading, special oozy cheese effects. But, in comparison, I'd argue there's much less fun and creativity in drawing a pepper. I realise it's not enough for me to just whinge about the findings, so I sat down (on a hungry stomach) and drew some comfort food. It gave me a few minutes away from what I was supposed to be doing which did help to clear the mind and make me feel better, but I think I would have felt the same if I'd drawn a beach scene or a clown. I don't think drawing the food itself lifted my spirits. It just made me hungrier. What do you think of the findings? 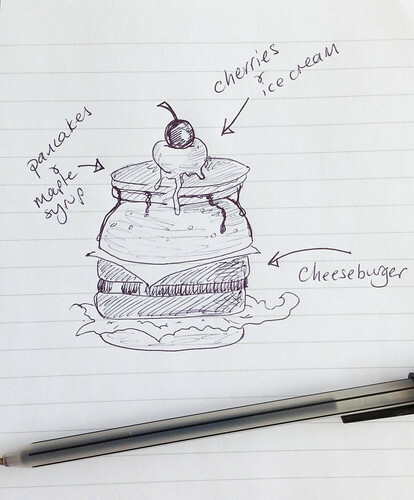 Do you think drawing your favourite comfort foods can help lift your mood?